Illinois State University's Sibling Weekend is April 11–13, 2014. When it comes to Illinois State’s Sibling Weekend, the Gamma Phi Circus shows are just the start. So as you’re planning what to do with your little brother or sister (or your entire family) when they come visit in April, check out STATEside’s rundown of can’t-miss events below. And share photos, tweets, and posts throughout Sibling Weekend using the official #RedbirdFamily hashtag. Illinois State’s historic circus, featuring highly skilled student performers, is celebrating its 85th anniversary this year. Gamma Phi’s Spring Shows are set for 7 p.m. Friday and Saturday (April 11–12), with a 1 p.m. matinee show on Saturday too. And before Saturday’s 1 p.m. show, there’s a children’s carnival (sponsored by the Student Alumni Council) that begins at noon with games and activities for all ages. All you need is your matinee ticket. All meal plan holders can bring up to two family members to one meal for FREE at either of the dining centers during Sibling Weekend. A reservation form will be emailed to all meal plan holders in late March, and you’ll need to sign up by April 9 to get the deal. Want more info? Contact CampusDining@IllinoisState.edu. What’s the only thing better than fresh waffles? 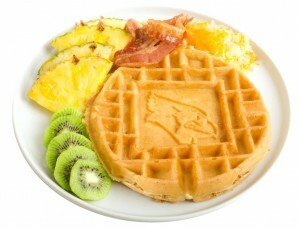 Fresh waffles with a Redbird logo imprint. Your family can order up Redbird waffles at Watterson Dining Commons throughout Sibling Weekend. Get your sibling a creative take-home souvenir with free caricatures on the second floor of Bone Student Center from 1–4 p.m. Saturday, April 12. The artist will be located near the Barnes & Noble–Illinois State University Bookstore, along with free food and other giveaways. Here’s a great (and free) way to end the weekend: Take your family to a Redbird baseball game at award-winning Duffy Bass Field. The game vs. Webster starts at 2 p.m. Sunday, April 13. Admission is free. If your family rolls into town Friday night, swing by nearby Cherry Berry (503 South Main Street, Normal), for a FreeStyle FroYo Concert with Dan Henig, hosted by UPB. Illinois State students get $2 off their frozen yogurt purchase, and everyone gets the chance to showcase their talents through karaoke or open mic. Musician Dan Henig will perform. Great way to start Sibling Weekend.